WASHINGTON (CNN) - U.S. Secretary of Commerce John Bryson, who is under investigation for possible felony hit-and-run after allegedly causing two weekend car accidents in California, suffered a seizure, a Commerce Department spokeswoman said Monday. Police said Bryson was found unconscious at the wheel of his car on Saturday after the two accidents. Bryson, 68, was issued a citation at an area hospital where he received treatment, said Lt. Ariel Duran of the San Gabriel Police Department. Authorities must still decide whether to formally file any charges. Bryson voluntarily took a breathalyzer test that detected no alcohol use, the Los Angeles Sheriff's Department confirmed Monday. Results from a separate blood alcohol test were pending, Duran said. A police statement Sunday said the investigation was in "its preliminary stages," and that there was no indication of alcohol or drugs playing a role. You can read the full story about Saturday's incident here. 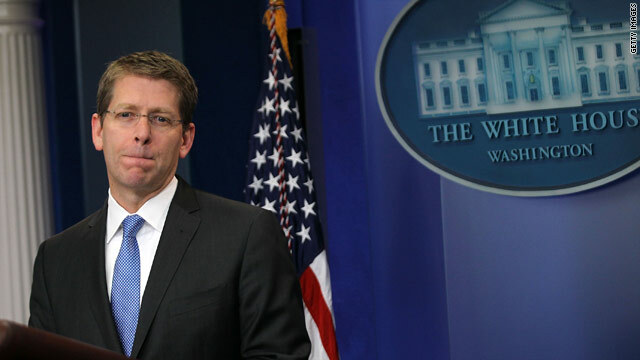 Today’s briefing by White House Press Secretary Jay Carney spanned many topics, everything from the impending release of the IAEA’s report on Iran’s nuclear program to the actions of the Congressional ‘super committee’ to the proposed Keystone natural gas pipeline. We certainly expect it to echo and reinforce what we've been saying about Iran's behavior and it's failure to live up to its international obligations and it will, I'm sure, echo our concern about Iran's nuclear program. What I can also say, because of the leadership of this president, we have mobilized the international community in a way that has never existed before to take action to pressure Iran, to isolate Iran. We now have in place the most aggressive, isolating and debilitating sanctions regime ever. And that regime has had an impact, as the Iranian president himself recently noted. We continue to focus on a diplomatic channel and it is because of the kind of consensus that we've achieved at the international level among our partners and allies in dealing with Iran that we're able to continue to isolate and put pressure on Iran and to insist that Iran get right with the world and live up to its international obligations. German Chancellor Angela Merkel (C) talks with French President Nicolas Sarkozy (L) and US President Barack Obama prior to the start of a round-table meeting on November 3, 2011 during the G20 Summit of Heads of State and Government in Cannes. 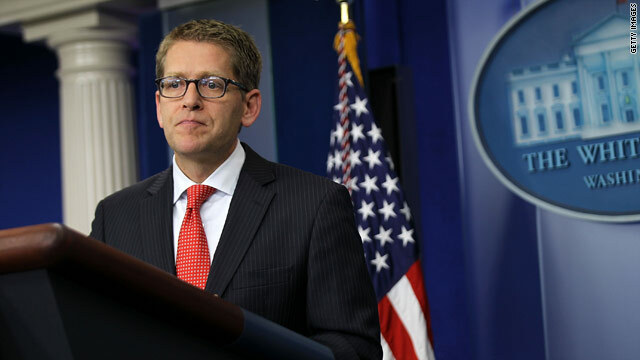 Today’s G-20-themed briefing came in from Cannes, France and was brought to you by Press Secretary Jay Carney with special guests Deputy National Security Advisor for Strategic Communication Ben Rhodes and Deputy National Security Advisor for International Economic Affairs Mike Froman. Q Answer this question as it relates to Greece, since that’s the country that’s in crisis right now, and if they go, are you worried about the contagion effect? MR. FROMAN: I think right now the highest priority in Greece is stabilizing the situation. But the program that Greece has is also about reforming its system and engaging in structural reforms so that it could become more competitive and therefore grow as part of the euro area. MR. RHODES: I just want to make one very quick point, which is that you’ve seen at these other G-20s often this discussion of growth and fiscal consolidation. I think what’s represented at this G-20 is a broad understanding that you need both; that there are going to have to be steps to promote growth and job creation in the global economy, and there’s going to have be, again, that kind of deficit reduction over the medium and long-term that many of the leaders have worked on. And similarly, in the United States, President Obama is pursuing an approach where we have an immediate growth package represented in the jobs act, and the other steps that we’re taking to promote growth and job creation at home. And we have a plan for significant deficit reduction in the medium and long-term as well. Bill, as all of you who know him, can be very candid and clear in his language. There is no question that when this president took office in January 2009 we were in an ungodly, bad situation economically. The economy was in free fall. Bill was speaking, I think, broadly about presidents and Congress, but there's no question that Democrats haven't agreed, or some Democrats haven't agreed… on everything. What's remarkable about the situation in the Republican obstructionism when it comes to the measures to create jobs and grow the economy is they're alone. Even within their own party. They're the outliers. The Republicans in Congress because Republicans out in the country support building roads, and bridges and schools. They support putting police officers and teachers back to work. They support tax cuts for everyone who receives a paycheck. They support tax incentives for businesses of all kinds to hire veterans. They support a tax cut, a payroll tax cut, for employers for small businesses to help them grow and expand and hire. And significantly, because this is the problem according to the Republicans, they support the pay for. 2.5 per cent growth may be better than it was the previous quarter, but it is not good enough. Absolutely not good enough. You know we all speak enough frequently with economists to know that 2.5 per cent growth is not – while it is positive, is not enough to significantly affect employment. We need to take action to ensure that the economy grows faster, and to ensure that more people get on the job and go back to work. 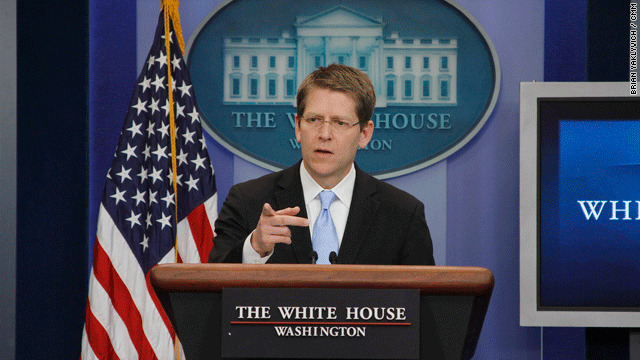 White House Press Secretary Jay Carney briefs reporters Wednesday. Ahead of the president's major jobs speech tomorrow to a joint session of Congress, White House Press Secretary Jay Carney offered few specific details at today's briefing. Carney also spoke about the upcoming 9/11 10th anniversary saying there are "no specific threats" but the White House remains "vigilent". (CARNEY) "As part of his proposal, the president will identify specific, scorable measures that will ensure that the jobs and growth measures are paid for." (CARNEY) "...he will put forward, both in his speech and in supporting material, a very detailed series of proposals to grow the economy and create jobs. ...how the process moves forward, in terms of engaging Congress and working with Congress to pass those measures, I will leave for a later date. But you can be sure that they will be specific, they will be measurable, they will be paid for. And they will be, by any objective standard, the kinds of measures that have enjoyed bipartisan support in the past." (CARNEY) "I am not going to get into specific numbers about the cost of the proposals he puts forward. I will say, as I've said before, that they will be paid for...The important factor here is not the top-line number. It is the substance underneath the number." (CARNEY) "He will tomorrow night put forward a jobs and growth package that he is quite certain responds to what the American people are demanding and is responsive to what the American economy demands." 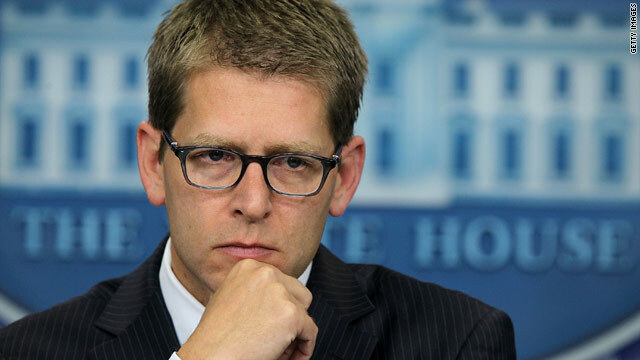 (CARNEY) "[T]here are no specific threats to which we are responding. But we are obviously very vigilant and are taking all the precautionary measures, both seen and unseen, that we believe are necessary around this anniversary." (CARNEY) "[Y]esterday the president convened a meeting in the Situation Room with senior members of his homeland security team to ensure that all necessary homeland security measures, precautions are being taken in advance of the upcoming 10th anniversary of 9/11." "...[Y]ou've seen the report about the Department of Defense. I think they've spoken to that and the measures they're taking regarding military installations in the United States. This is a precautionary measure, and we don't have any specific credible threats. But obviously this is a significant anniversary. 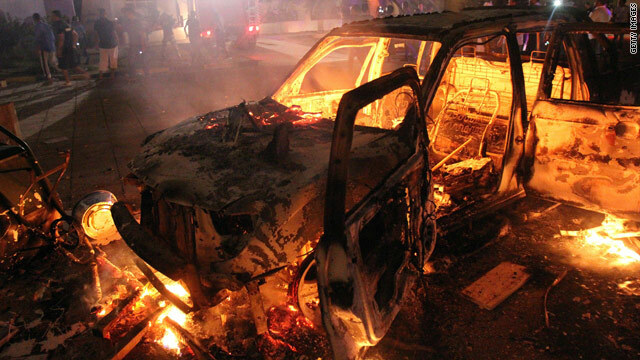 Al Qaida and others have expressed interest in anniversaries in the past. So we remain ever vigilant through the anniversary and beyond." Question: [What is the message] for liberal Democrats who are saying...that the president gave up too much in this agreement? "...the deal negotiated with leaders of Congress is a victory for the American people. This agreement ensures that the debt ceiling will be extended through 2012, removing that cloud of uncertainty from the economy. [T]he agreement ensures that there is an initial round of spending cuts that protect vital investments, that will ensure that the economy can continue to grow, protect vital things like Pell Grants, that are a high priority for the president, and, significantly, ensure that there's a fire wall in the discretionary spending cuts between defense and non-defense spending which, again, is a kind of protection we haven't seen in a long time that is essential to making this a fair and balanced deal. [T]here is a committee set up... that will be bicameral and bipartisan, with equal representation between Republicans and Democrats. And that committee will be charged with finding ways to ensure - finding ways to reduce the deficit even further - $1.5 trillion further. And everything is on the table for that committee, everything including both entitlement reform and tax reform." Question: [W]hat's the message to Democrats who see this as a capitulation, who see it as a bill that reflects more of the Republican priorities than the Democratic priorities? 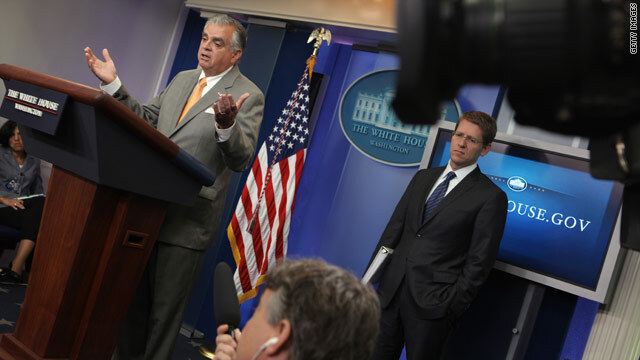 Transportation Secretary Ray LaHood at Thursday's White House briefing with Press Secretary Jay Carney. We continue to believe and remain optimistic that Congress will come to its senses, that cooler heads will prevail and that a compromise will be achieved. As I just spelled out, it really isn't that complicated at this point. What we need to do is get beyond voting on dead on arrival measures that aren't going to become law when we have so few days left to reach a compromise. We need to get that kind of political theater out of our system and get to work on something that can actually pass both Houses with bipartisan support and be signed by the president. All I'm saying is the president was at the table, the potential agreement was on the table, the grand bargain, and the speaker walked away from the table over an issue that can be resolved quite easily. If the political will is there, we can move back to those negotiations. If that isn't possible in the next five days, then there are ways that we can resolve this issue in a fair compromise that does the key things, which is lock in significant cuts and lift the cloud over our economy and ensure that we're not, you know, playing in this three-ring circus for the next six months. ...I think I've indicated, and I will say it explicitly, that the chances aren't great that we end up between now and August 2nd with a sweeping, grand compromise between the Republicans and Democrats that reduces the deficit $3 trillion to $4 trillion over 10 years, includes balance between entitlement reform and tax reform. That's not likely, but it's available if the political will is there. This is a time that I think most of us that have watched politics have never seen before. Because there are people in Congress who don't like the word compromise, who don't believe in it. We need for people to come together, to set aside their own egos and a certain part of their own agenda for the American people to make sure we maintain the strongest economy in the world to send a signal to the world that we can get big things done. Since Congress failed to pass an FAA bill, nearly 4000 FAA employees have been furloughed and as many as 70,000 construction workers across America are out of work. Important airport modernization projects have been shut down in every state in the country.